Despite a gloomy economic climate, Gill Holland pressed forward with several socially conscious projects this year. Not content to sit still, he's planning more for the future. Holland recites a synopsis of what locally is becoming his familiar backstory: Childhood in North Carolina. Law school. Paris law firm. Ditching that to pursue producing movies. New York. Marrying Augusta Brown, the daughter of a former Brown-Forman CEO. Moving to Louisville less than four years ago. For Holland, not so much. 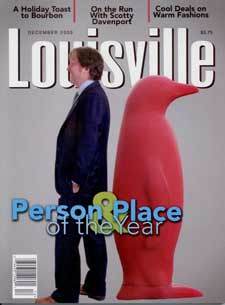 And his capacity to project long term — along with his enthusiasm to challenge the rest of us to consider our city’s future — is one of the reasons Gill Holland is Louisville Magazine’s 2009 Person of the Year. During a year of economic stagnation and a cautious business climate, he has plowed forward with socially conscious projects. “Pretty big year for me, 2009,” Holland says. Among the highlights: The trendy 732 Social, a restaurant that opened in 2009 inside the Green Building, which Holland owns with his wife, on East Market Street. He penned a children’s book that has raised $20,000 for the Speed Art Museum’s interactive gallery for kids. There’s a CD: All proceeds from the recently released Louisville Lullabies, which features local musicians, will go to the Home of the Innocents, a local refuge for children. Meanwhile, under his guidance, several of the East Market Street properties he and his wife own with other investors are under construction and giving shape to the neighborhood, which this year added NuLu — Holland’s SoHo-inspired nickname for the area — to its street banners. An inaugural NuLu Festival christened the art-district concept. Today, his pulpit is the third story of the Green Building, the more-than-100-year-old structure the Hollands purchased for $450,000 and renovated for more than $1 million. This is his headquarters. Exposed, crisscrossing beams of partially recycled wood are attached to the soaring ceiling, which gradually slopes from the back of the building to the front windows. Natural light floods the space. There is an elevator, but Holland says he has considered posting a sign: “It’s an effing green building. Take the stairs.” A downstairs “green wall,” which he says is the state’s first, went in this year and has sedums and ferns growing from it. Eighty-one solar panels help power the place, which Holland says is 72 percent off the grid and has prevented 350,000 pounds of carbon dioxide from entering the atmosphere in its first year. In his office, Holland is relaxed behind his messy desk, his caffeine fix coming in the form of a can of Diet Coke. 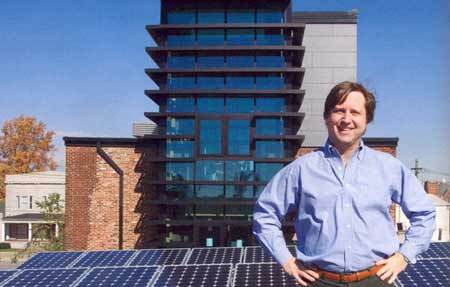 “People are going to look back at this building and scoff that we’re not 100 percent off the grid,” he says. “They’re going to look at our clunky solar panels like they do old cell phones. The time he spends reading to Cora, his almost three-year-old daughter, inspired Louisville Counts, the book he wrote and got local artists to illustrate. He’s now working on a version for New York, where he lived for 13 years, and he is two letters shy of completing L is for Louisville, an alphabet book. “The kids are going to be the ones who save us, so we have to get to them early,” Holland says. He’s made the rounds with FLOW: For Love of Water, a documentary he produced, even screening it for elementary-schoolers. Moseley expressed frustration when the petition drive succeeded, but looking back now, she doesn’t blame Holland; rather, she points to the East Downtown Business Association, which she says did not honor an agreement it made earlier that would have permitted Wayside to expand. “Gill’s the one who gathered the signatures and filed the petition to the Landmarks Commission,” Moseley says. “Gill Holland has a vision for East Market Street. We couldn’t afford to fit in with our properties landmarked. Holland wants to market the city with T-shirts that say “Louisville” on the front and “Staff” on the back. Both he and Steve Wilson, co-owner of 21c Museum Hotel (see page 52), say they’d like to brand our town as the “City of Arts and Parks,” a slogan Holland has trademarked. “I go back to the Confucius ideal that a city with great culture attracts power and wealth,” Holland says. “There’s a reason Seattle has companies like Microsoft. The 20something, creative hipster wants to go to a city that has clean air and nice parks. We have tons of nice parks. We don’t have the clean air, and that’s a problem. Holland says light-rail transit systems should exist between Louisville and Fort Knox and Frankfort, Ky. That’s just part of the picture. Also: No passenger cars downtown; rapid-bus transit would transport people instead. Parking garages would become offices. Mountaintop removal would end. Local farmers would provide meals to schools, jails and government buildings so the food’s not coming off a truck traveling cross-country. An entrepreneurial, tax-free zone downtown would attract start-ups. (“Right now, we’re trying to get existing companies to move,” Holland says. “That’s like trying to get a girl who already has a boyfriend to come date you.”) “In a perfect world, the city would be able to put out some kind of bond issue where low-income families — or anybody who wanted — could borrow some money, put solar panels on their roof and pay off the city bonds with the savings that they get from their LG&E bill,” he says. The Hollands have installed solar panels on the roof of their Cherokee Road home. Did you consider running for mayor? “I got some fan mail. I had a bunch of people ask me to run for mayor, and I said, ‘I’m having twins,’” he says. If there hadn’t been twins? A Portland project is on the horizon?